Here's a balloon animal that will prove to be quite popular. It's an elephant that's complete with his trunk and ready to be part of the herd. 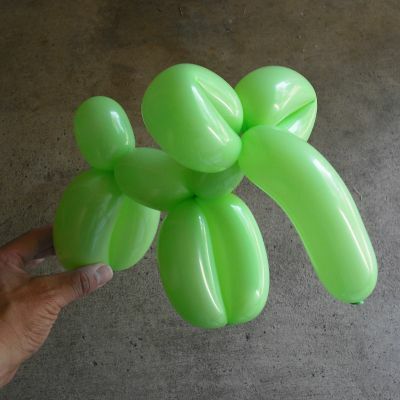 To make this balloon animal, you will need to know already how to make a dog balloon animal and have mastered the fold and lock twists. Inflate the balloon leaving at least a two-inch tip. Starting at the knot, make a "trunk" by taking the first balloon segment and bending it so it holds its shape. You'll want a trunk to be about five inches long. Make a fold twist. You're creating the first of two ears. Make a second fold twist. You’re creating the second of two ears. Make a short basic twist that is about an inch in length. You're making the elephant's neck. Make a lock twist for the front legs. This is similar to the front legs of a dog balloon animal. Make a short basic twist to form the elephant's body. Make a lock twist for the back legs. Leave a short segment for the tail.